By Rein Houben, London School of Hygiene & Tropical Medicine, and Pete Dodd, University of Sheffield. In rich countries, tuberculosis is sometimes thought of as a thing of the past, the disease that claimed Keats, Poe, Chopin. But globally, TB is today the number one infectious killer, causing an estimated 1.8m deaths in 2015. Unlike many bugs, infection with the bacterium that causes TB doesn’t usually result in disease. The usual dictum is that only 10% of people who are infected will ever develop TB, but this may occur many years after initial infection. The flip side of this is that latent infection with Mycobacterium tuberculosis is far more common than the disease – and it is commonly stated that a third of all people worldwide carry it. The fraction of people with TB disease has declined, despite upswings associated with HIV in some regions through the nineties. Developing new ways to address the pool of latent TB infection is now seen as an emerging front in its control. Clearly it’s time to reevaluate the “one-third” figure, which has become an oral tradition. In a new paper published in PLOS Medicine, we reconstructed the “force of infection” for TB – the chance that an individual would become infected with Mycobacterium tuberculosis – in 180 countries (equivalent to about 99% of the world’s population) over the past 80 years. We approached this by compiling data from surveys testing for latent infection, largely prior to 1990. After 1990, we used estimates from the World Health Organisation on the prevalence of TB, and data relating prevalence to infection risk. The further back our estimates went, the more uncertain they became, especially for countries where data is sparse. So we took account of this uncertainty in our analyses. We found that closer to a quarter of today’s global population has a latent TB infection – around 1.7 billion people. More than 80% of this burden is concentrated in Asia and Africa, where it is usually concentrated in older age groups as the prevalence of infection increases with age. Despite this, we estimate that nearly 100m children (more than the entire population of Germany) already carry a latent TB infection. 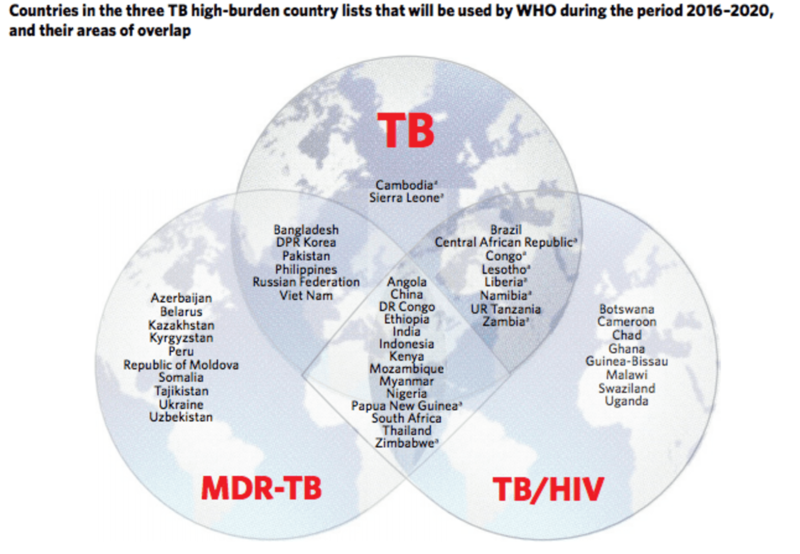 Country overlaps with TB, multi-drug resistant TB, and HIV related TB. The sheer numbers of those infected show that TB is not only still with us, it also needs to become a priority if we are going to address this ancient disease that still infects over a billion people, including 100m children, and causes more than 10m cases of disease and nearly 2m deaths each year. It’s much more than a numbers game, TB is a deadly reality. « Are ‘informal providers’ a short-term fix for India’s primary healthcare system?